Those were the words of Deputy Secretary of Agriculture, Dr. Kathleen Merrigan, this morning when she addressed the audience of the USDA’s and Farm Foundation’s seminar “Local Food Systems: Emerging Research and Policy Issues”. Academic, industry and USDA speakers, primarily from the Economic Research Service staff, went way below the surface of local and regional food systems to get at the roots of and raise the many current issues and challenges of meeting the growing demand of local foods in the US. While not everyone agreed on what the definition of local is, it was clear to everyone that the USDA needs a lot more money than it has in its budget to bring local and regional food systems to the next level. Like “organic”, there is not one definition of what locally grown food is even among the researchers. Throughout the day, we heard various definitions of what local food is, about food miles, and someone even used one of my favorite terms "food print". Some said “local” is within a hundred miles, referencing the “100-mile diet”, others said 200 miles, 250, 350, even 400 miles. In the latest Farm Bill local can mean within your state or within 400 miles, which of course is meaningful for big states like New York, Texas and California. We also heard that a large chain grocer in California has misused the term local to seemingly add cache to its produce as it allegedly labeled produce “local” even if it was shipped all the way from Texas!!! A strong argument for the “premium” price charged for local produce is that it’s a value-added product and really should not even be compared to conventionally grown food – local tastes better - value add #1 - is better for the environment -- value add #2 - and is better for the businesses in the region and the state -- value add #3 (I would add that locally grown produce is likely to have more nutrition from its being fresher and also may have more trace minerals and other micronutrients/antioxidants as a result of being grown in healthy soil with no or low pesticides or chemical fertilizers- value add #4). The speakers covered a lot of territory from the rapid growth in the past two decades of community supported agriculture and farmers markets to the rising demand of local by consumers in the face of limited production capacity and an inefficient supply chain infrastructure. The challenges for the small farmer are many, especially those that are mid-sized farms that can’t afford to sell direct to consumers, and include topics beyond the scope of what you would expect – growing, sorting, packing, storing, transporting and selling – to include procurement and quality control, accounting systems, food safety and post-harvest protocols, trace back mechanisms and more. One speaker called on the USDA to recognize backyard, school and community gardens that are producing fresh food. Another underscored the importance of prisons, hospitals, and schools in the farm to institution movement. And, another presented case studies on several cooperative and other aggregator models that not only provide value-added products and cost efficiencies but also represented the “values” that we’ve come to expect from sustainable and local agriculture. I learned a lot about what researchers, and business owners and farmers on the front line of “alternative” agriculture are doing and what’s going on inside the USDA under the new administration. 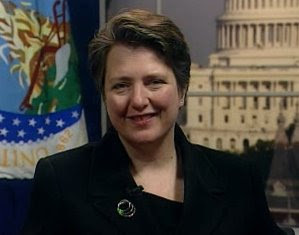 One piece of encouraging news is that Dr. Merrigan, since she arrived at the USDA just a few months ago, is cataloguing all the activities and projects that every department is working on that benefits local and regional food systems.Another is that budgets have increased in the recent past for research of fruits and vegetables (vs. mono-crops) and programs such as the Farmers Market Promotion Programs. As part of the Economic Research Service projects, the USDA will be conducting a much needed study comparing regionally grown foods to produce that is sourced from longer distances, including globally, to better understand the tradeoffs – social, economic, and environmental. Questions such as: are workers treated properly?, how much energy is used?, what are the carbon emissions? and what is the cost from production through to consumption and waste disposal? will all be part of the analysis. It was a privilege to attend and be a part of taking the local and regional food movement to the next level. GREAT JOB!